Austrálíà (o-STRAYL-yə, or /ɔːˈstreɪliə/ aw-STRAY-lee-ə), fun ibise bi Orílẹ̀-èdè Àjọni ilẹ̀ Austrálíà, je orile-ede ni Southern Hemisphere to ni gbogbo ile orile Ostralia (to kere julo laye), erekusu Tasmania, ati opolopo awon erekusu kekeke ni inu okun India ati Pasifiki.N4 Awon orile-ede to ni bode pelu ni Indonesia, East Timor, ati Papua New Guinea ni ariwa, Solomon Islands, Vanuatu, ati New Caledonia ni ariwa-ilaorun, ati New Zealand ni guusuilaorun. ↑ "Demonyms - Names of Nationalities". about.com. Retrieved 2008-07-23. ↑ "Demonyms, or what do you call a person from ...". The Geography Site. Retrieved 2008-07-25. ↑ "Population clock". Australian Bureau of Statistics. Retrieved 2008-07-22. ↑ Macquarie ABC Dictionary. The Macquarie Library Pty Ltd. 2003. p. 56. ISBN 0 876429 37 2. 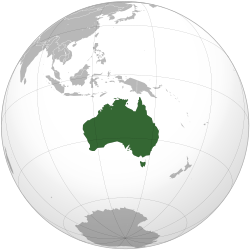 ↑ "Australia". Encyclopædia Britannica. Retrieved 2009-08-22. "Smallest continent and sixth largest country (in area) on Earth, lying between the Pacific and Indian oceans." Àtunṣe ojúewé yi gbẹ̀yìn wáyé ni ọjọ́ 1 Oṣù Kọkànlá 2015, ni ago 13:41.